When Levi moves from California to Wisconsin in eighth grade, he and Macallan hit it off from the start. They bond over a favorite British television show and become fast friends. They begin to do everything together and even their families grow close. People constantly make the assumption that they are a couple, but they keep denying that, saying they are simply best friends and nothing more. However, as the years go by and relationships come and go, they realize that their “friendship” is getting in the way of other things. Dates accuse them of focusing too much on each other, boys won’t ask Macallan out because they think she’s dating Levi, and the two begin to wonder if something more is possible, or if they’d be better off staying friends. This was a really cute story! I was already a fan of Elizabeth Eulberg because I loved her previous book, The Lonely Hearts Club, so I knew I would enjoy this one. Better Off Friends is basically a high school version of When Harry Met Sally, and equally as good. I really liked both of these characters. Macallan is tough, and she isn’t afraid to stand up for people. She has an uncle with a slight mental disability, and she treats him like her second father. Whenever anyone even slightly makes fun of him, she is super quick to defend him no matter what, which shows how good of a person she is. Levi is another great character–he doesn’t push Macallan to talk about her mother’s death, but makes himself available in case she ever wants to bring it up. The two are really great friends to one another, which makes it easy to understand why they would be hesitant to change their friendship into something more. What I loved about this book is how it followed Levi and Macallan from when they first met in eighth grade and continued on through the rest of high school. By doing this we’re able to see how they grow up together and how they change over the years. They each go through their own series of relationships and friendships with other people, yet they manage to stay friends through even the worst times. The only time they seriously begin to falter is when the hint of something more appears and they both get nervous about the possibility of ruining their friendship. Overall, Better Off Friends is a really cute story about best friends with the potential for more. I loved the way each chapter followed with a conversation between the present day Levi and Macallan reminiscing about each memory. 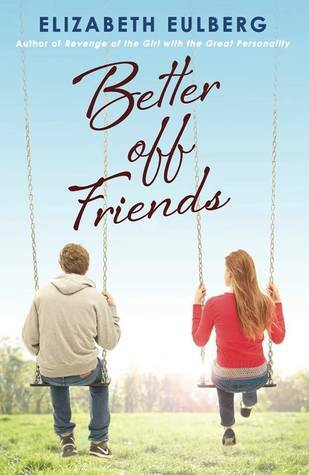 Better Off Friends was released on February 25, 2014.